Tour of a Ukrainian missile silo Jump to media player Silos that housed Soviet nuclear missiles are now a tourist attraction and reminder of Ukraine's Cold War past. Putin's nuclear 'sabre-rattling' Jump to media player President Vladimir Putin said Russia would put more than 40 new intercontinental ballistic missiles into service this year. 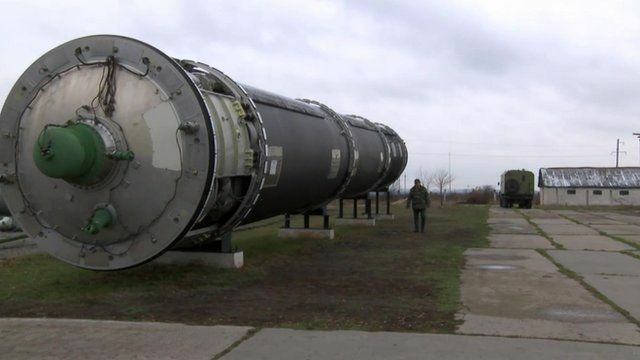 Missile museum opens in Ukraine Jump to media player The base was once a hub for the Soviet Union's most advanced nuclear missiles and military technology. It was one of the most feared weapons of the Cold War and was dubbed "Satan" by Nato. The USSR's SS-18 missiles were over a thousand times more powerful than the bombs that destroyed Hiroshima and Nagasaki with the full arsenal capable of global destruction. 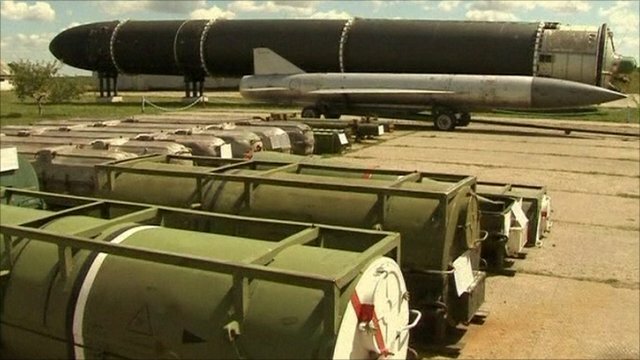 After the fall of the Soviet Union, similar missiles - called SS-24s - ended up in the hands of Ukraine, which agreed to decommission them. Ukraine has put an SS-18 on show at a museum in Pervomaysk. The missile silos there are a tourist attraction and reminder of the nation's nuclear past. The SS-18s were deployed in Russia and Kazakhstan. Produced by Albiy Shudrya (correspondent) and Anastasiya Gribanova (camera) of BBC Ukrainian.